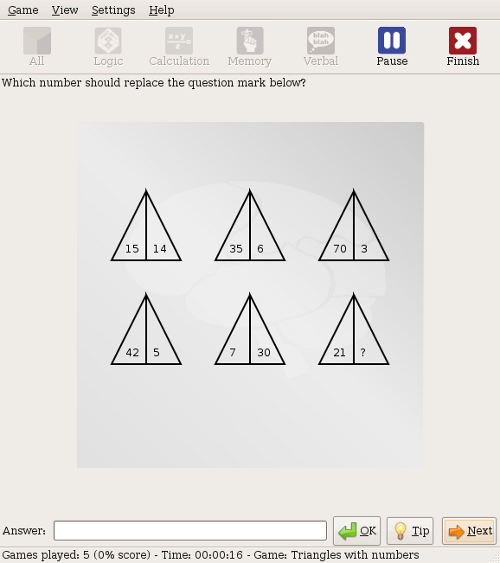 gbrainy is a brain teaser game and trainer to have fun and to keep your brain trained. 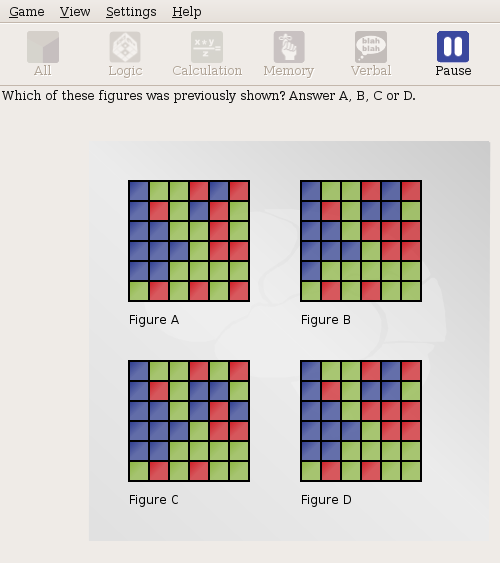 Logic puzzles. Games designed to challenge your reasoning and thinking skills. Mental calculation. Games based on arithmetical operations designed to prove your mental calculation skills. Memory trainers. Games designed to challenge your short term memory. Verbal analogies. Games that challenge your verbal aptitude. gbrainy provides different difficulty levels making gbrainy enjoyable for kids, adults or senior citizens. It also features player's game history, player's personal records, tips for the player, or fullscreen mode. gbrainy can be also extended easily with new games developed by third parties. It is designed for GNOME and runs on top of GNU/Linux and different Unix flavours. There is also a port for Microsoft Windows. 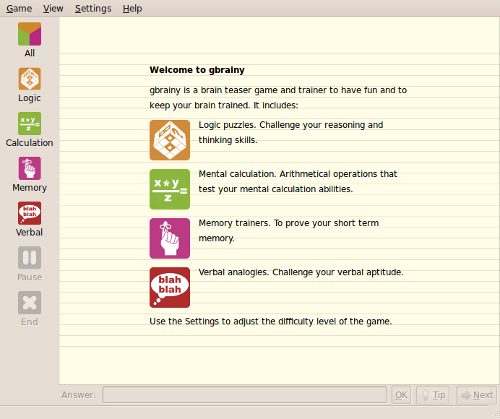 To produce gbrainy, a free and open brain teaser game for Linux, Windows and other platforms. To bring a platform (gbrainy.Core) that other people can use to build up their own applications or clients. To author a collection of free and open brain teasers described using XML that can be consumed by any other application. See games.xml and verbal_analogies.xml. There is a collection of Frequently asked questions about gbrainy. In a standard Ubuntu installation the packages required to compile gbrainy are: intltool, mono-gmcs, mono-devel, libmono-dev, libgnome2-dev, libgnomeui-dev, libmono-cairo2.0-cil. Latest stable released version is 2.4.0. Packages for Fedora (Also build with OpenSuse build service). Packages for One Laptop Per Child. Mono live CD includes all the Mono tools and gbrainy. gbrainy is a game designed for Linux but however it can run on Win32. gbrainy installer for Windows installs the application and the translations that were 95% when the installer was built. The language that gbrainy is used in based in your Microsoft Windows locale configuration. Browse the code on-line using https://gitlab.gnome.org/GNOME/gbrainy. Once you finish, just run it using the gbrainy script or using mono gbrainy.exe. gbrainy is written for GNOME using Mono, C# and Cairo. There is a development page with all the information for people willing to do bug fixing, develop or extend gbrainy. There is a detailed roadmap for future versions. See the previously released versions since August 2007. You can summit bug reports for gbrainy using the issue tracker. Play the game and provide feedback about the application. Translation to different languages. Check the current status of gbrainy translations. Please, read our recommendations on the areas that you should give special attention when translating gbrainy. Any development aid, including fixes, new puzzles or verbal analogies. Ideas for new logic puzzles or game trainers. If you like gbrainy, blog about it and tell your friends about it! There is a gbrainy public group where people can share its experiences, ideas and get involved in gbrainy development. If you have ideas or experiences it is better if you use the list instead of writing to me directly.